Description: What is Christian Ethics? How should it be taught? Why and how might better connections be forged with biblical exegesis, systematic theology, liturgical studies, ecumenism and other disciplines in the academy? What personal formation occurs in the good teaching and learning of Christian Ethics in universities as well as seminaries? How do our geographical locations, disciplinary alignments, ecclesial traditions and research interests shape our answers to these questions? 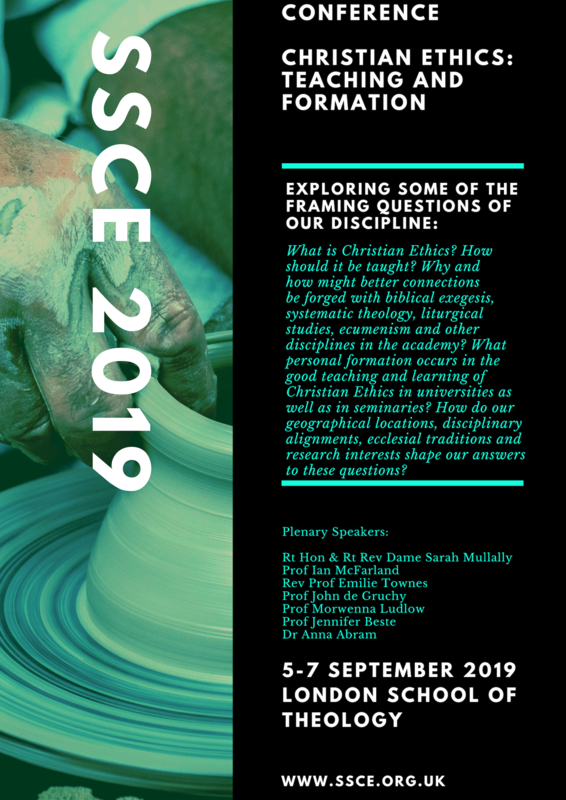 Book your place at SSCE 2019. Discounted early bird booking rates are available until midnight on June 30th 2019. Conference booking closes at midnight on 31st July 2019. Information about how to apply for bursaries can be found here. The cancellation policy is here. The full price list including early bird and standard prices is here. Call for Papers: If you would like to submit a 500-word proposal for considering, click here for more details (you will be redirected to the announcment on the homepage). If you have any questions, contact B.J. Condrey at conference@ssce.org.uk. We are pleased to announce that registration for our 2019 annual conference is now open. We are pleased to announce our 2019 conference which will be held on the theme of "Christian Ethics: Teaching and Formation". 2019 Spring Postgraduate Conference - Registration now open! We are pleased to announce that registration is now open for the 2019 Spring Postgraduate Conference in Durham! The postgrad conference will take place 1 April in Durham. The Call for Papers is now live. Call for Papers: 500 word proposals by 4 May. Conference registration now open.